Planning for an event is no easy task! It may be a family wedding or an office party, but a million details that go into organizing it can get overwhelming for most people. Which is why it is best to rope in professionals for the job! Chennai with its culture of big fat weddings has no scarcity of wedding planners. So, make the most of it and hire one for every marriage in the family. 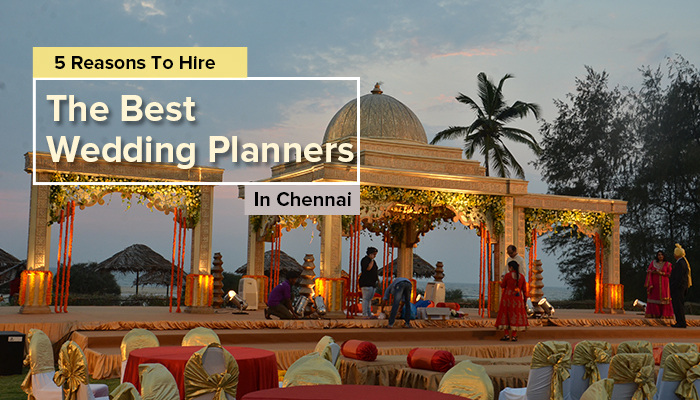 Here are five reasons why you should be researching the best marriage planners in Chennai for your upcoming wedding already. A Wedding Or Engagement Event Planner Brings A Lot To The Table! Professional event planners come with a wealth of experience that cannot be matched by regular folk. They would have come across everything that could go wrong at a wedding already and would bring their best practices and lessons learned on board. As a result, they offer proper guidance in all our choices. They would be in a position to let us know if any of our suggestions may or may not work, based on prior experience. Being in the wedding business for ages, the best wedding planners in Chennai have plenty of contacts and connections among the other players in the industry. They have personal knowledge about the services offers by vendors and can suggest the right people for every service you need for your wedding. Right from finding the perfect venue, they can take care of every wedding-related details for you. Many event planners have regular tie-ups with vendors and hence can get very good deals and discount from them. Many wedding planners in Chennai offer in-house services such as catering or decorations and give them at competitive rates as part of their wedding package. It usually works out to be the most economical option. But of course, you would have to give due diligence to check if their services are up to par before hiring them. Setting up the event venue for a wedding or engagement is one of the primary responsibilities of event organizers. Getting your inputs on the decorations, flowers, and other elements and putting in all the details to bring your vision to life is their forte. They are especially great with themed weddings. Running around to get the right materials and props to set the mood for the event is no mean feat. But professionals can do it at the drop of a hat! Save Yourself A Lot Of Trouble By Hiring A Wedding Or Engagement Planner. With the best in business taking care of the wedding details, you can breathe easy and save yourself a lot of stress and anxiety. Everything will like clockwork with professionals at the helm. All you need to is sit back, relax, and actually enjoy the whole event for a change! Weddings are meant to be enjoyed, and not get stressed! So, do the best thing possible and hire an event manager for organizing your wedding or engagement ceremony. PreviousTop 5 Birthday Party Decoration Ideas You Never Knew About!